I’ve a passion for sour flavours, even those sour fizzy sweets, created with a mixture of citric acid and sugar, that you find in corner shops. There is a mouth-puckering masochistic pleasure from the acidity, and combined with sugar, it shines even more tartly. Rhubarb, the unforced kind, is seasonal right now, from April to June. I also love the sherbet flavours and beach hut colours of passionfruit, gooseberry, lemons, raspberries, sour cherries, lemon and grapefruit. Other sour foods, considered good for your health, are vinegar, yogurt, pickles, kefir, sauerkraut, buttermilk. Most curries contain some kind of souring agent, be it yoghurt, dried mango powder or tamarind. They add a welcome acidity to curries, punching through the oil and spices. Try these summery light refreshing dessert recipes. The perfect pudding for an al fresco meal. All of these can be whipped up in minutes. Home cooks are unjustifiably frightened of soufflés. I recently did a P and O ‘culinary’ cruise with patissier Eric Lanlard, who, in a masterclass, reignited my love of soufflés. He gave me a few tips. 1. 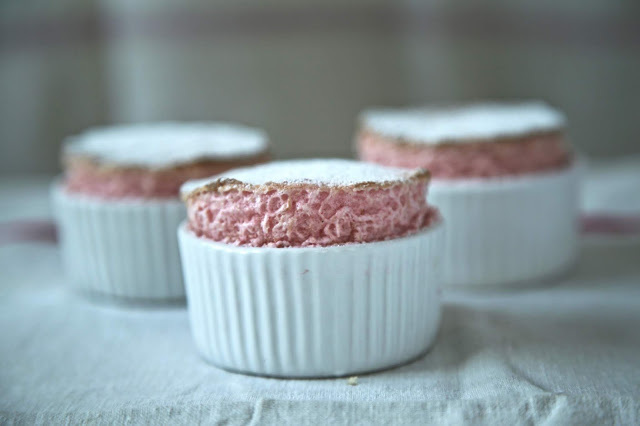 Butter and sugar your ramekin, if making a sweet soufflé. 3. Flatten the top with a palette knife. 4. Run your (clean)fingernail around the inside rim of the ramekin, making a small line between the dish and the soufflé. It’ll rise better. 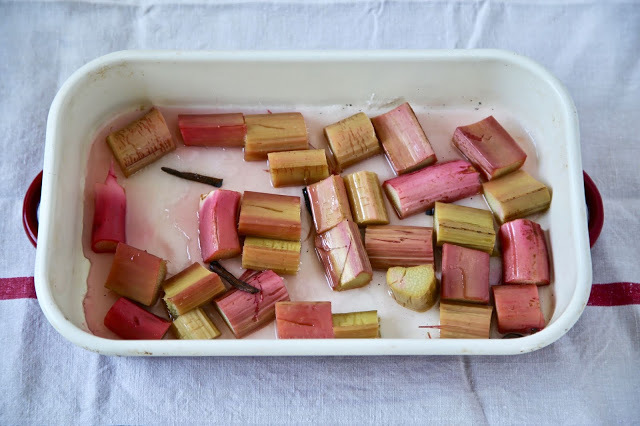 Roast the rhubarb for 30 minutes in an oven dish, with the sugar and vanilla pod. When soft but still intact, remove from the oven and let cool. Whisk the egg whites into soft peaks then gradually add the rhubarb and syrup. Level the top with a palette knife. Run your thumbnail around the inside rim. Cook for 12 minutes in 200c oven. Remove and sprinkle a little icing sugar on top. This is one of the oldest English recipes, dating from Tudor times. I made it with ice wine but any sweet dessert wine will do. It’s so simple yet deliciously naughty. 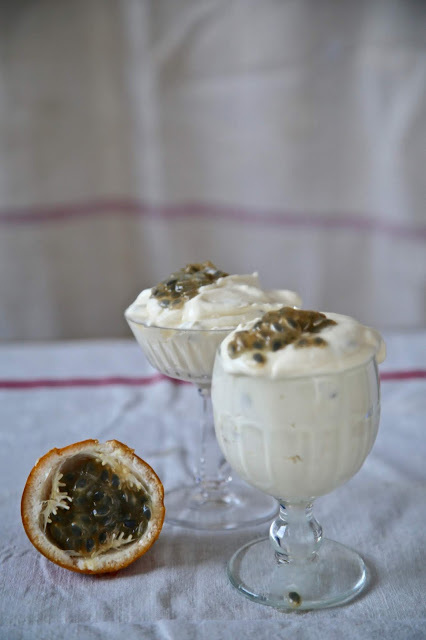 Whisk the double cream into soft peaks then add the dessert wine, the sugar and 1 1/2 passion fruits. Continue to whisk. 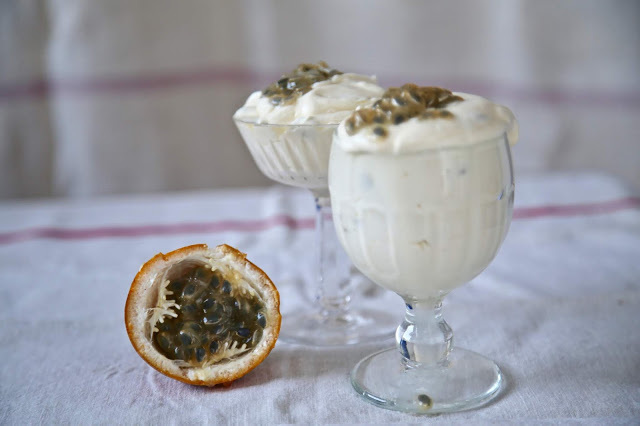 Spoon into decorative but sturdy glasses and top with the remaining passion fruit. 1. The old-fashioned way, over a Bain-Marie and stirring for a long time. 2. 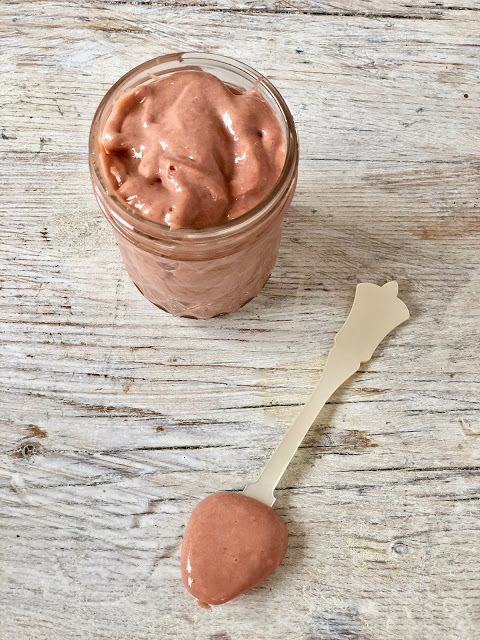 The high-powered blender, easy and quick. 3. The microwave method, also very rapid. 1. Cook the raspberries in a medium saucepan over a low heat. When they break down, sieve them to remove seeds. Return the raspberries to the pan and add the butter, sugar, lemon juice. Whisk together then gradually add the cubes of butter. Keep stirring for about 20 minutes until the mixture has thickened. 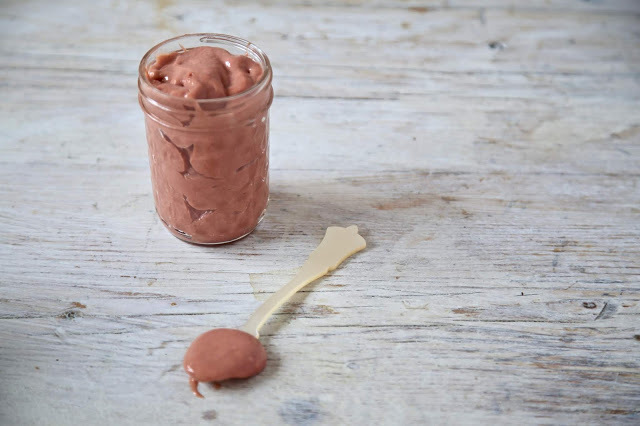 Scoop into sterilised jars. 2. I use a Vitamix for this. Every day I fall more in love with this blender which saves so much time in the kitchen. Because this pulverises every ingredient, you don’t need to deseed/sieve the raspberries. Put all the ingredients except for the butter into the Vitamix. Blend for 5 minutes on high. Then, reduce the speed to 5 and gradually add the cubes of butter one by one until incorporated. Finally push back up to high speed for 30 seconds. Pour into sterilised jars and chill which sets it. 3. In a glass or ceramic bowl, whisk together the sugar and eggs. Add the sieved raspberries, lemon juice and butter. Microwave for one minute, each time mixing the ingredients together thoroughly. Do this repeatedly until the mixture coats the back of a spoon. Pour into jars and chill. My next supper club is Swedish themed, a Midsummer event, hopefully in the garden. Swedish chef Linn Soderstrom and I are getting together for the 4th year running to do our annual Swedish midsummer night’s feast. These are always popular so book early. Food: home smoked salmon, sandalwood herrings, vegan meatballs, Finnish Karelian pies with egg butter, strawberry cake, crispbread, Scandinavian cheeses, gravad lax. Look: Swedish/Scandi/flower crowns/Viking/ Sheild Maiden. Bring: your own booze. (Swedish vodka, beer, cider, perry, aquavit is recommended). Love the recipe for the souffles! Do you put the rhubarb at the bottom of the ramekins? I did on the first test but actually it rose better without the rhubarb in the bottom. Good to know .. I'd love to try!